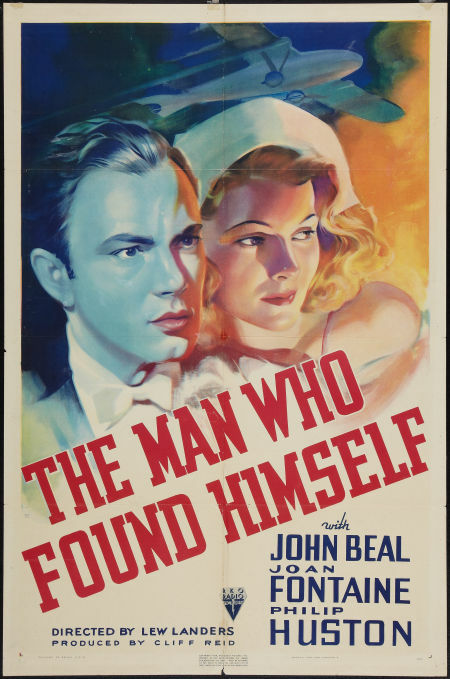 THE MAN WHO FOUND HIMSELF is a fast-paced RKO "B" movie about a doctor who falls on hard times but "finds himself" thanks in part to the love of a devoted nurse. The movie starts off with lightning speed, fitting an appendectomy, a fatal plane crash, and a scandal into just the first few minutes. Dr. James Stanton Jr. (John Beal) has a devil-may-care attitude toward his hobby as a pilot, which causes his doctor father (George Irving) great concern and has disastrous results when the plane goes down in bad weather and causes the death of a friend. Even worse, the friend was a married woman and Jim is unfairly implicated in scandal regarding her marriage. After being disciplined by a medical board, Jim hops a train for California. 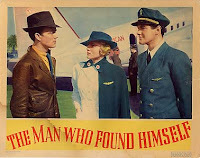 Eventually, thanks to an old friend (Phillip Huston), Jim is employed as a mechanic by an air ambulance company, and when Nurse Doris (Joan Fontaine) falls in love with him, she sets out to restore Jim to his prior career and make things right with his temperamental father. There's a whole lot of plot jammed into 67 minutes, including a train crash and Nurse Doris paying an interesting visit to Jim's one-time fiancee (Jane Walsh); the busy story keeps the movie entertaining even when it verges toward the silly (Dr. Jim becomes a hobo?!). I also admit I rather enjoyed all the cute miniatures used for the plane and train crashes. Once Doris enters the scene, the film becomes especially enjoyable. This was Joan Fontaine's fourth film and first major role, and indeed, the film has a special ending with her face on the screen and the words "This picture has introduced to you a new RKO screen personality, Joan Fontaine." She's charming, although it's interesting to note that her accent is all over the place in this, sounding British at times and American at others. Leading man John Beal's acting career stretched for six decades, with his first movie in 1933 and his final film, THE FIRM, in 1993. His work included narrating Disney's SO DEAR TO MY HEART (1948), which I watched last summer. This film was directed by Lew Landers, who directed a huge number of "B" films as well as TV shows, including two episodes of my favorite series MAVERICK. Turner Classic Movies has had something of a Landers festival this month, and I've recorded a number of his RKO films. This movie isn't on DVD or VHS but, as mentioned, was just shown on Turner Classic Movies. i have this recorded! i recorded it for Joan Fontaine i adore her. thanks so much for the write up now i know what i am getting into haha.